This is actually one of my favourite anime, but I'm going to keep this short and sweet. On the surface (haha) this seems like your average lovey dovey middle school heartbreaker series but there's a lot of adult concepts. Common themes include racism, the complexities of love and friendship, and sacrifice. It follows the characters as they navigate a new world, new friends and the tragedies of growing up. The animation is just beautiful and basically any scene set in Shioshishio looks incredible. Like I mentioned, big fan- do yourself a favour and watch. Whimsical and Will Melt Your Heart! After watching a slew of violent animes, this was such a nice break! The concept was one I had never really seen before, and all the characters are so wonderful. You really do love each and every one of them. The plot had so many love triangles and plot twists (Even if some a bit predictable). All in all I think a great one to watch. Warning: As someone who was never give the chance to connect with his own culture; get ready to be sad. Also I ship Manaka and Minua so hard. The style is so pretty and I loved the story line! It had me hooked (no pun intended) from the beginning! It is tragically sad but ends in such a wonderful way. It's not the kind of anime I usually watch and yet I highly recommend it to anyone that wants to watch something a little different. This series is truly great. The story, animation and characters are all very high quality. The seaside setting and interesting fantasy elements are also a refreshing change of pace from the mundane school-based stories typical of this genre. My only criticism is that it was exasperatingly melodramatic at times so I detracted one star. It's happened before where I have seen an anime that I felt was so good that I had to give it a symbolic 6th star because I thought it deserved to be rewarded a rank hiher than the scale allows. With Nagi no Asukara, I feel it deserves the symbolic 7th star. I've never given anything a 7 star before because I only thought that something really good deserves to go to 6 stars. After seeing Nagi no Asukara though, I knew it would be unfair to give it the rating that the other series got because it is by far the best one I have seen. This coming of age story manages to take on the prevailing theme of fear of loss, and mix in other themes such as fear of change and racism and still manage to not feel like too much is crammed into the story. The emotions of the characters comes through clearly to the viewer and causes a feeling of connection between character and viewer. The character development is beyond any I have seen so far. 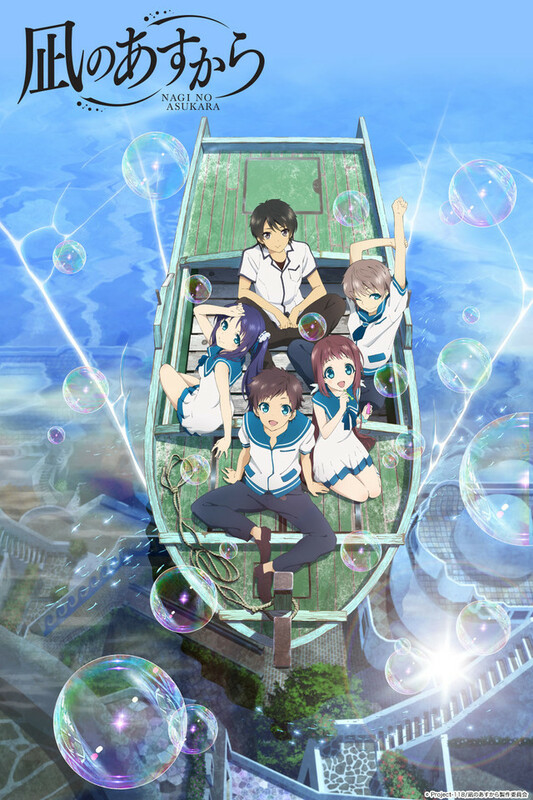 The story is about a world where people live both on land and underwater and follows five middle school students as they figure out there place in the world and learn how to deal with their feelings for each other. Over all, most viewers will fall in love with this series. This was a surprise because I was't expecting to like this show as much as I do. The world of this anime is interesting and captivating. This is definitely for those who like character centered anime because this show doesn't dive too deep into the setting and world.